For 2019, the Infiniti QX60 is an ideal vehicle for families needing to haul people and cargo in a luxury package. See how it makes life a little easier. If you need a family hauler with luxury, you don’t need to spend $65,000. The 2019 Infiniti QX60 can be had for $45K and offers the things families are looking for: A large and roomy cabin, a quiet and smooth ride, and leather-appointed stadium-style seating. The fold-flat second-and third-row seats offer up the flexibility you need for mixing passengers and cargo. No major changes but has some revised trim level names for 2019MY. The 2019 Infiniti QX60 Luxe ($45,800) comes standard with automatic xenon headlights, LED foglights, heated side mirrors, a sunroof, a power liftgate, keyless entry and ignition, leather upholstery, tri-zone automatic climate control, power-adjustable and heated front seats, a 60/40-split folding second row, a 50/50-split folding third row, Bluetooth connectivity, a 7-inch central touchscreen display, a rearview camera, and a six-speaker sound system with satellite radio, a CD player and a USB port. V6 models get three additional charge-only USB ports. Infiniti offers lots of optional packages for the QX60 and they can add up quickly. Our tester came loaded with extras. This QX60 tester came with the Limited Package ($5,000) featuring Stone semi-aniline leather seats, wood accents, dark 20-inch aluminum wheels, and dark chrome exterior trim. The Sensory Package ($3,500) added Bose premium sound, seat quilting, cooled front seats, heated second-row seats, and motion activated tailgate. The Proactive Package ($3,400) included a suite of safety technology. The Essential Package($2,900) featured navigation, Around View Monitor, and front and rear sonar sensors. The Theater package ($2,150) added a dual-screen rear-seat entertainment system as well as a 120-volt power outlet. Total MSRP including destination: $65,930. Families looking for a stylish, roomy, comfortable interior with third-row seating, will have plenty to keep them happy here. Attractive is the first word that comes to mind when you step into the QX60 LUXE cabin. It conveys a luxurious air that begins with the Maple wood accents on the center console and dash. The materials on the door panels, seats and soft-touch dash all shout luxury. The two-tone interior treatments are especially appealing. The second-row seats are comfortable and there’s lots of room for the kids to stretch out. The QX60 offers a second row that can tilt, fold, and collapse, and the second-row bench can travel 5.5 inches fore/aft. This allows easy access to the third row, even if a child safety seat is mounted. The second-row seat folds neatly forward adding extra utility. The optional Theater Package with dual 7-inch color monitors is perfect for those longer trips and it will keep the kids entertained for hours. Like most third-row seats, the QX60’s are best for younger family members who are bit more agile and don’t mind the lower cushions. If you need cargo carrying ability, the QX60 will be there when you need it. With second and third rows folded down, cargo space totals a cavernous 76.5 cubic feet. Behind the third row, the volume is 15.8 cubic feet. 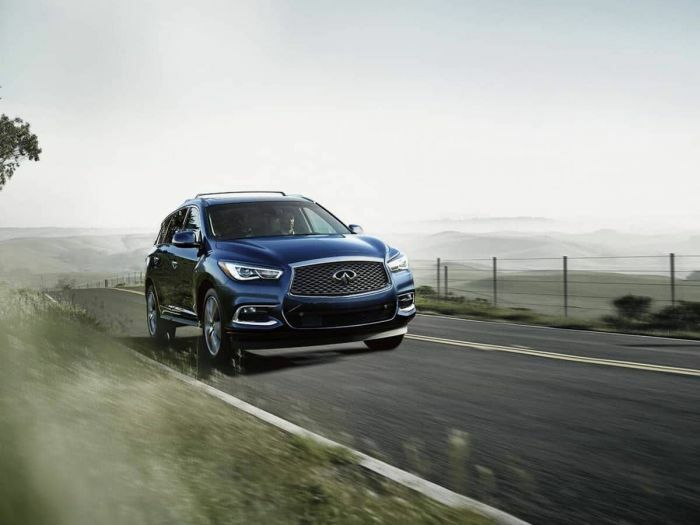 The 2019 Infiniti QX60 comes standard with front-wheel-drive and is powered by a 3.5-liter V6 producing 295 horsepower and 270 pound-feet of torque. It comes paired to a continuously variable automatic transmission (CVT). The CVT comes with Sport, Snow or Eco modes that control throttle response and shift points. EPA fuel mileage estimates for the front-wheel-drive gasoline model are 20/27 mpg city/highway and 22 combined mpg. Behind the wheel, the QX60 feels substantial and has a commanding presence on the road. It’s a car you will feel safe in. This tester came with a suite of safety features that warns the driver of any impending obstacles forward and aft. When backing out of tight city spots this week, we knew exactly where the vehicle was in relation to other cars around us. The feature came in handy as the QX60 is a formable size. On the road, the QX60 is smooth and quiet. It’s more practical than stimulating to drive. The crossover has respectable power for most driving situations. We pushed it hard up I-70 west of Denver into the higher altitudes and the vehicle kept us moving past slower traffic without issue. In the city, QX60’s length can be an impediment when parallel-parking. We found the safety sensors to be extremely helpful and recommended if you live where there are narrow urban streets. The retuned suspension added firmness to the ride without improving much agility. The QX60 had some body lean in the tight mountain curves near Evergreen as we pushed the big crossover hard. It also features Eco, Standard, Sport, and Snow drive modes. We switched the CVT to Sport and was impressed with the transmissions ability to imitate gears in a conventional, 6-speed automatic transmission. For such a large vehicle, visibility to the rear is reasonably good, provided the third row is not in use. The adjustable headrests can be folded down for improved visibility. 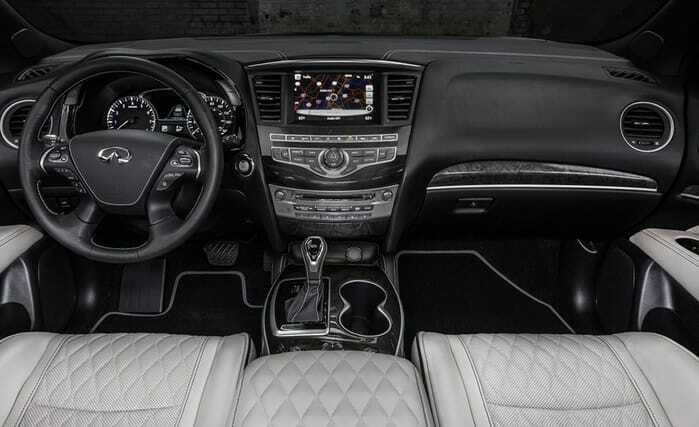 The 2019 Infinity QX60 LUXE model has the interior flexibility and roominess, safety, and advanced hospitality features buyers are looking for. Infinity did succeed in meeting families needs. The QX60 adds in an extra level of luxury for consumers looking for a high-end family hauler. Infinity offers lots of extra options, but they can add up quickly pushing the total price up considerably. Overall, the QX60 with its luxurious interior fittings is a vehicle that will make life easier for families.